I’m not sure that Spring Break is the best time to plug a project, but I have been getting questions about this topic. So let’s call this the pre-announcment of the Sixth Annual 48 Hour Book Challenge and officially set the date for the weekend of June 3rd–5th. I will put up the official sign-up post with rules on Monday, May 2nd, but feel free to start spreading the word. In fact, I beg you to share the news. 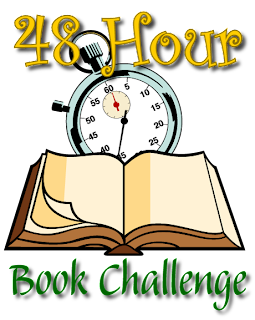 For a refresher on the rules, check out my 48 Hour Book Challenge standard information. Prizes are needed for our winners, so if you are willing to donate signed books, crafty ventures, illustrator sketches, reading paraphernalia, etc., I’d really appreciate it. Email me with those at MotherReader AT gmail DOT com. Personally, the selected weekend is going to be an issue for me because I have a Girl Scout event right in the middle of it, but I decided that it was better to keep the 48HBC the first weekend of June as a tradition. Plus also, my weekend was completely open last year and I didn’t knock it out of the park anyway, so maybe having a few obligations — or one large obligation — actually helps keep reading focus. If nothing else, it will let you know that you can participate even if you have to block off a large chunk of time during the weekend. Because whatever you’re doing, it is not as crazy as taking twelve sixth graders to a Medieval Times dinner and joust. Right? I've been plowing through my stack. I'd have to get a whole new stack. Huzzah! Is it sad to admit that I keep this event in mind when planning summer programs at the library so that I can try to be free all weekend? I judged correctly! WOO! Can't wait! At the beginning of the year, I switched my Saturday (I was supposed to have worked the Saturday of the read-a-thon) in anticipation that it would take place the first weekend in June. I'm glad I picked the correct weekend! Nooo!!! This is the weekend before finals! Does studing count as reading if I am doing a bunch of calculus problems??? Sounds like a lot of fun. We're taking our twelve year old and six friends to medieval times next week. I'm putting this on the calendar. This is going to be great. Thanks for doing it, it'll be my first one! TeenReader Tuesday: Is He or Isn’t He?